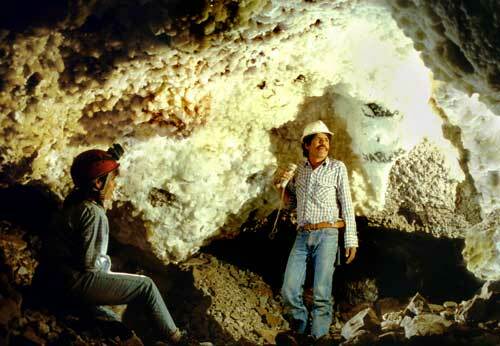 “MEXICO HAS NO LAW PROTECTING CAVES” are the final words at the end of the film Naica, Journey to the Crystal Cave, reminding us that Peñoles, the mining company which owns the cave, could grind up the unique, giant crystals of this cave and turn them into toothpaste if it wanted to, and it would be perfectly legal. We have, therefore, resurrected this true story of our visit fourteen years ago to several natural caves found in two other mines in Zacatecas, also owned by Peñoles. We hope what you are about to read will encourage you to help support the movement to ban cave vandalism in Mexico. April, 1996. 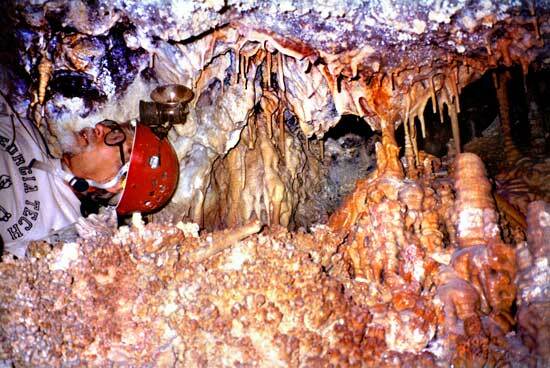 "The caves I saw are absolutely marvelous," exclaimed a geologist friend of ours. "The ceilings, the floors, every inch of the walls are covered with crystals ── it's as if you had walked into a gigantic geode." There were a few hitches, however. First, it seemed the stupendous caves in question were located deep inside some silver and gold mines which, in turn, are located far, far, away in northern Mexico. Besides that, we would need permission to enter the mines and to take photographs. But our friend assured us he would cut through the red tape. All in all, it sounded like a well worthwhile project, as these caves ── which had no natural entrances ── were destined to be destroyed "in the normal course of mining operations" and our photos might someday be the only records of their existence. When the long Easter holidays arrived, we packed up our little Bug and drove eight hours north, through the seemingly endless Zacatecan desert, to the famed mining town of Concepción de Oro, nestled among barren mountains pockmarked with black gaping holes and enormous mounds of slag, sludge or whatever miners call the goop left over after the precious minerals are extracted. A lonely stretch of desert in Zacatecas. We drove up and down Concepción's steep, narrow streets past quaint little houses and shops right out of the 1800's, looking for the road to Mazapil, a small town somewhere out there in the desert, not far away. Finally someone told us that there simply was no road to Mazapil, even though our map showed one. However, back on the main highway we were guided to an unpaved road buried under three inches of fine white powder. We were told that if we really stepped on the gas, we might reach Mazapil before sunset. Unfortunately, we didn't get far before we came to a fork in the road, naturally with no signs whatsoever. But as luck would have it, a truck came along just then and just happened to be going to Mazapil. So we asked if we could tail them and in no time learned all about the advantages and disadvantages of following someone through the desert on those powdery roads. The disadvantages are that you can't breathe and you can't see. The advantage (just about the only one), however, is that—should the car you are following race ahead at breakneck speed—you can always spot that choking white dust cloud, no matter how far you get behind or how many times the road divides. The bright green Joshua trees stood like prophets with arms raised in supplication, between us and the smoothly sculpted mountains in the distance, and everything was bathed in the golden rays of the setting sun. I only wish it hadn't been setting precisely in front of us, turning that dust cloud we were following into a blinding white swirl that left us with zero visibility. Squinting and choking, we drove into town just as darkness descended. We stopped to ask some kids for the home of our friend's friend, Pancho. "He's our papá," they replied, "but he's not at home now; he's at the cantina." There's only one thing you'd be doing at a cantina on a holiday, so we weren't surprised when Pancho staggered out the door with a bottle of tequila in his hand and a big grin on his face. Soon we learned, however, that the grin was due to genuine happiness at seeing us and not merely to the contents of his bottle. Any friends of his friend were Pancho's friends too and he'd be delighted to take us to the mine the next morning, hangover or not. But in no way would he allow us to go off to camp in the desert. We were to sleep in the mining company's facilities; all we'd need was the key, which Pancho would get from Señora Fulana who was attending Mass just now. So we chatted about mines, caves, geology and whatnot until Señora Fulana appeared. "The key?" Oh, I can't give it to you without written permission." Fortunately, even remote places like Mazapil have telephones and soon we had the Guadalajara boss of the mining company on the line. Unfortunately, however, our friend who had promised to "cut the red tape" had only informed the American boss in Tucson about our visit and not the Mexican jefe. "NO!" came the final word from Guadalajara, "you CAN'T stay in our facility and you can't visit the mines either. And by the way, your friend no longer works for us. So there!" This was not turning out quite the way we had figured. Twelve hours on the road and the whole project squelched because of somebody's petty squabbling. We left town and slept beneath a moon so bright you could read the fine print on an insurance policy... in case you'd ever want to do that instead of enjoying the sounds and sights of the desert at night. 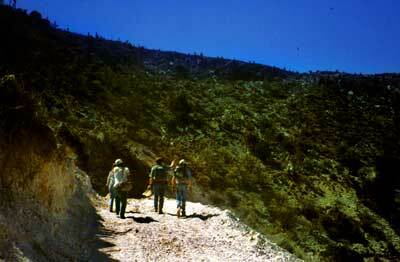 The next morning we went hunting for Nick Hawkes, a geologist friend who had planned to meet up with us in Mazapil. Nick was all smiles. "I've just talked with Pancho and he's decided to take us to the mines anyhow." 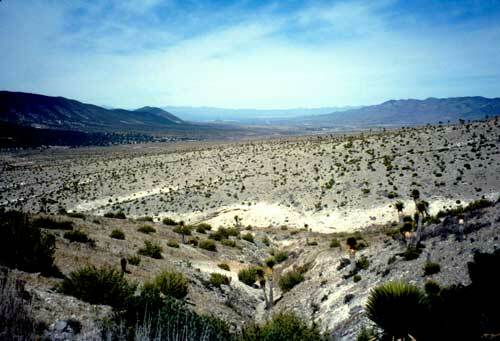 It turned out that some of the mines with caves in them hadn't yet been purchased by the uncooperative mining company. So, according to Pancho, they had no right to forbid us entry. Besides, the guard responsible for keeping us out was none other than Pancho's cousin, whom we had met at the cantina last night. There is something they call the "Mexican Standoff" but here was what you might call the "Mexican Solution." It was an excellent example of how the impossible can become possible in Mexico. The "road" up to the mines was another dusty delight, especially for those of us riding in the open bed of Nick's truck. There was the usual lack of shoulders and the usual 1000 foot drop on one side, but this road was so narrow you almost had to fold the truck to get it around the hairpin curves. The last curve, in fact, was so tight, we just abandoned the vehicle there and walked the rest of the way up. Getting around in mines is a lot easier than negotiating caves as all the passages go in straight lines and there are handy ladders on all the pitches. Of course, there's always that lingering doubt about how strong the roof supports are, something cavers don't have to think about. Aesthetically speaking, however, wandering around in a mine is not the most exciting thing in the world. At last we came to a low hole on the side of a passage. All around this hole we could see what looked like fine aragonite "feathers." "This is the cave," announced Pancho. We stooped over and stepped in. The small room shimmered by the light of our lamps. The ceiling and all the walls were pure white, covered in some places with clusters of sharp, pointed, nearly transparent crystals and elsewhere with rounded nodules, creamy-white and often with tiny "fingers" growing near their bases. On a larger scale, these thousands of nodules formed gently rounded "clouds" and hundreds of sparkles responded to every movement of our lights. These miners had broken into an absolutely stunning fairyland but they were obviously not interested in following the cavers' golden rule, "Leave it the way you found it." Instead, they had chopped away many big hunks of the ceiling and carefully covered the smoother walls with ugly black graffiti. Next, they had decided to take advantage of the empty space they had found by filling it up with the rubble from their tunnel-making. In fact, we soon discovered that this small room (about 7 by 7 meters) was really part of a far bigger cave, most of which was now filled nearly to the top with unwanted debris. It was oh so beautiful, but we didn't bring up the video camera and we didn't take a single picture. We were just too jolted by the contrast we were experiencing. Nature had made this little room so perfect and there it was, up and out of the way, bothering no one... yet someone had decided to use it as a toilet. The browns and blacks of several deposits of human excrement on the sparkling white "snow" seemed like some sort of allegory on nature's purity besmirched and I felt a bit like Dr. Pepe Sanchez who refused to get out of the car to see the marvelous dance of Michoacan's monarch butterflies, after discovering that their ancient forest home had been turned into a four-ring circus of soft-drink stands, ramshackle restaurants, roaring engines and crowds of loud tourists. I climbed down from that stinking room rather shaken. We exited the mine, went into another one and this time were taken to an entirely different kind of cave, again one which had no natural entrance. Here, instead of smooth walls, were a tangle of stalactites, stalagmites and columns, colored every possible shade of brown and red. 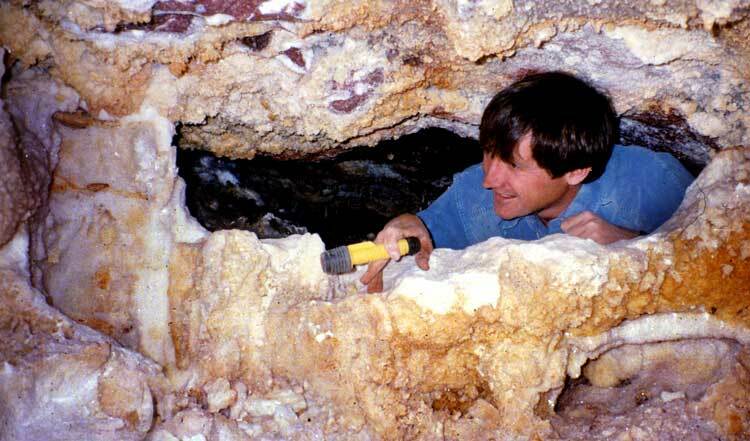 Here, too, were the small pointy gypsum crystals we'd seen in the other cave. In the first room we came to, all the soda straws and other breakable formations had been snapped off, but we found several crawlways that were very difficult to negotiate as their floors were covered with crystals as sharp as broken glass. 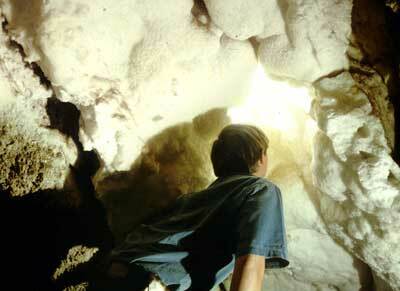 This factor had protected the rooms beyond from damage and we found areas thick with lovely formations. John admiring the beauty of a small crawlway. As we left the mine, I couldn't help ponder the paradoxical situation we had been introduced to. If it hadn't been for the mines, no one would ever have been able to enjoy the sight of these caves. Nevertheless, the caves were destined to be destroyed. Of course, caves accidentally found by miners are few and far between. Most caves in Mexico are accidentally found by country people, who, due to lack of awareness, rather than malice, inevitably break off (and later throw away) every stalactite they can get their hands on. A law protecting caves may help a little…and a program promoting awareness about caves may help a lot.